The music had been playing the significant role to the society for centuries. It had been one of the first means of communication. Our forefathers used to show their feelings, emotions, and intentions by playing the music and singing. Music also had played the fundamental ritualistic role. Every important event was accompanied by the particular music. That is the form of art that seems to appeal to every human being. Music also influences other art forms as the powerful mean of inspiration and motivation. The overall progress provided the ability to create and listen to music to everyone. The same progress also creates a huge worldwide music industry. The other fundamental art form is the visual art. This is the oldest documented art form that developed along with performance art. The visual art is about representing experience, subjective reality, emotions, as every other art form. The development of human race stimulated the development and partial confluence of the art forms. The result of such confluence is the appearance of the theater, performance arts, etc. 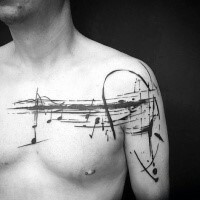 Music tattoo is the powerful fusion of visual and performing arts. 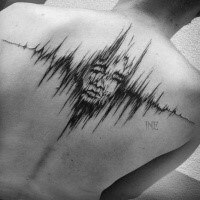 The music tattoos are not just a popular image on the human body. It is the meaningful symbolic message that tells a story about the person. 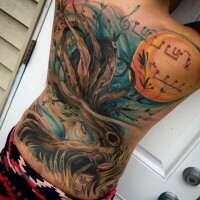 Some people comments the story their music tattoos are telling. 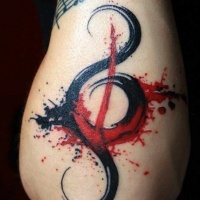 One of the popular internet communities users said about her clef and notes tattoo, "Because when people haven't always been there for me, music has." 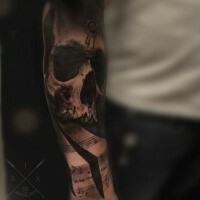 The variety of music tattoos covers the whole spectrum of styles and types. 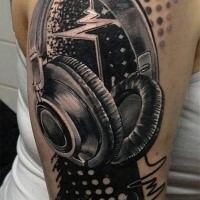 People love music tattoos as they love music itself. 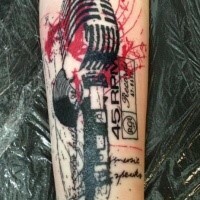 Doing music-related tattoos is not the prerogative of artists who compose or play music. 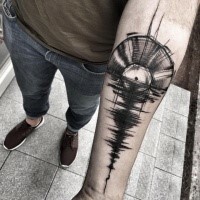 These tattoos appear on bodies of people who find inspiration, peace, love, energy, and literally the whole spectrum of feelings and emotions in music. This sort of tattoos is pretty popular among people of different social status, professions, age and gender. The tiny symbolic music tattoos appear on fingers, ears, clavicles, necks. The complex big music related images cover hands and legs, backs and chests. 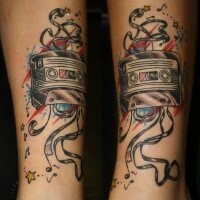 Music tattoos owners tell the world not only the story of their preferences and goals in music but in their lives. Their tattoos are about dreams, love, passion, honor. 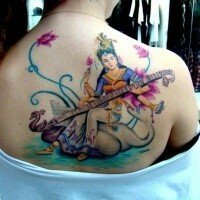 Music lovers prove that there is no wrong or place for the music tattoo on the human's body. The number of music related images and styles give people numerous possibilities to express themselves artistically. People often say that the music treats their wounds, help them to get rid of depression and feel better. They also do tattoos in order to remember the hard times, to pay a debt to this beautiful and powerful form of art that has scientifically proved its therapeutic effect. 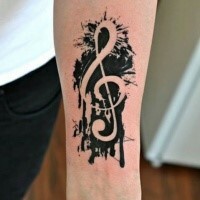 The music tattoos have a surprisingly big number of meanings and functions. People are often deeply attached to their past. So they often do tattoos that remind them of hobbies and events from the past. That could be an instrument they used to play when they went to school or the image that represents the music piece their parents offered them to listen often. The future is the unknown reality. Everyone wants to succeed in that reality. 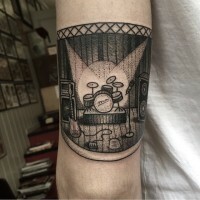 So people capture the direct or symbolic images of dreams and goals in the form of music tattoos in order to not let themselves forget and give up on something precious to them. 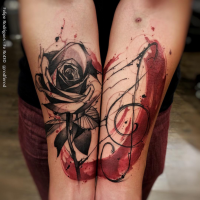 Music tattoos design varies from music instruments, notes, microphones, earphones, clef to expressions about music or songs lyrics, bands' logos, names and artists' portraits. 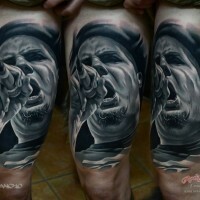 Another very popular type of the music tattoo is the tattoo made by fans of the particular artist. They dedicate tattoos and the part of their bodies to the favorite musicians. 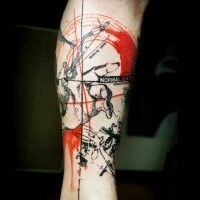 As well as music tattoos are not always about musicians, musicians don't always do music tattoos. 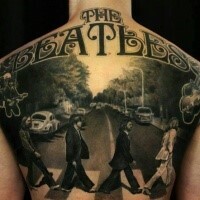 But their body art pieces often become iconic, especially among their fans. The sayings tattooed on the pop idol body spread to the bodies of fans, carrying not the original meaning but becoming the allusion. Most of the iconic personalities of the music industry had tattoos which themselves became iconic. That is the stylish and artistic way to express feelings or social position or whatever those artists wanted to express. This art form appeals to the musicians. It is as creative and unique as music. The images of instruments are usually the choice of those who can play these instruments. It made the tattoo very specific. 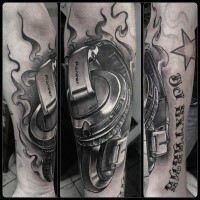 But such tattoos also could be dedicated to the beloved music genre. The image of a guitar is widespread, as well as the microphone or gramophone images. It appeals to both classic and pop music connoisseurs. The piano or violin would rather fit the classic music lover. 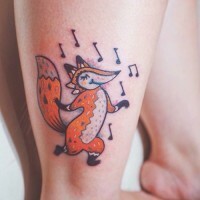 The general character of music tattoos is pretty similar to other tattoo types. Men prefer more chaste and even aggressive drawings. Women would rather choose fond and smooth image with such additional components as flowers, butterflies, birds, stars. Men mostly prefer to add the tiger, eagle or a dragon to complete the artwork on their body. But this rule doesn't always work with musicians and composers. The artistic personalities don't usually follow rules. So men could have tattoos on such places as ankle, finger or wrist. These body parts are generally considered to be more suitable for female tattoos. But artists create masterpieces breaking rules. 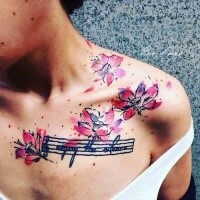 So music tattoos could be created without following rules. 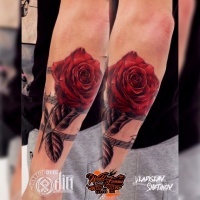 Those music lovers who don't want to obtain extravagant look usually choose more masculine or feminine tattoos according to the preferences. The growing popularity gaining tiny solitary tattoo that couldn't be noticed from the first sight. It could be a small image on the finger or ear, one note, a fiddlestick or a shape of a musical instrument. 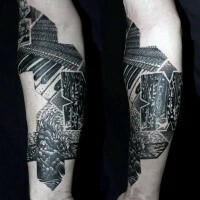 Usually, such tattoos are completed in one color, mostly black. The colorful tattoos could be done in two ways. The color gamma could represent the commonly accepted meaning of particular colors or be the colorful image that represents the diversity of feelings and emotions. 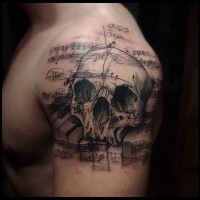 Music tattoo would be a good choice for everyone who loves art and wants to make his body stand out. There are not so many people who can live without music. So this theme appeals to all of us. The favorite music genre is the part of personality. It could be especially those part that a person wants to show everyone. And the variety of choices for a tattoo could satisfy requirements of the pickiest person.